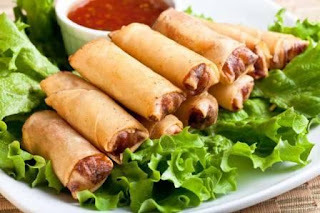 How to Make Lumpia Semarang Lumpia Semarang or usually refers to a spring roll on the restaurant's menu are snacks that actually contain vegetables. The lumpia semarang or spring roll is the typical snacks from the Chinese that have been applied by the Indonesian. The famous lumpia in Indonesia comes from the Semarang city with young bamboo shoots. However, not all people like bamboo shoots, other than if the wrong treatment, there is no pungent taste is obtained, but the terrible smell and taste is obtained. If you want to enjoy eating the delicious Lumpia Semarang and you dont have any time to go hunting this food in Yogyakarta, then make the Lumpia Semarang by yourself at home. Nowadays, there are two types of Lumpia Semarang recipe revolving in the community that is a lumpia Semarang wet and dry recipe. In this occasion this article will give the recipe to make the recipe of dry Lumpia semarang, because the demand is much more than wet Lumpia recipe. Therefore it refers to the content fried chicken and vegetable lumpia shredded and typical vegetable Semarang down that you can practice at home. It is also suitable for person who learns to cook. C. The steps to make Lumpia Semarang. Heat oil in a frying pan; fry the garlic mixture and ebi until fragrant smell out. Pour the chicken and shrimp. Stir it until the color changes. Set aside the the skillet. Then pour the egg. Fried sickle orat. Enter the shoots. Stir until wilted. Pour the soy sauce, pepper, salt and sugar sauce. Cook until all the flavors blend. Prepare a sheet of lumpia skin. Pour the filler ingredients on the spring rolls skin. Fold and roll the skin well and paste using of wheat flour. Oil in a fry pan with hot black spring rolls until lightly cooked and browned. That’s all about how to make Lumpia Semarang.